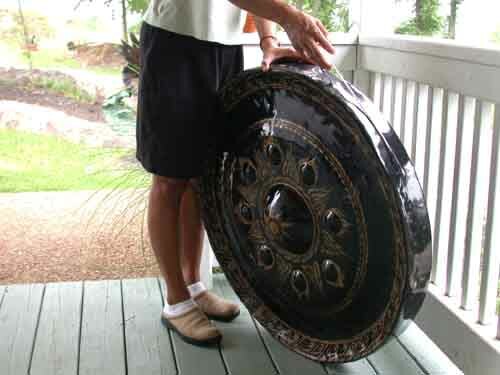 Authentic Buddhist Bronze Temple Gong 31"
Authentic Buddhist Temple Gong 35" Hammered Bronze. This is a genuine fired and hammered bronze gong from Southeast Asia. The custom striker is included. Stand may be purchased separately. Authentic Buddhist Temple Gong 31"
We stock have 5 different size Gongs ! This is a genuine fired and hammered bronze gong from Southeast Asia, seldom seen outside of Temples. This is not a factory made or toy gong. Few people know how to make these and they are not easy to find. There is great pride among the few who know this art. This is the genuine article and the sound is loud and beautiful. Bronze gongs sound much richer than less expensive iron gongs. We only sell Bronze gongs and Bronze bells. The custom striker is included. Serious buyers may call 1-800-321-8618 to hear the gong. This is a very rare and beautiful Gong that sounds Great! Insured UPS shipping is FREE in the lower 48 United States. Other destinations must be calculated. We ship from Tennessee. Call toll free 1-800-321-8618 if you have questions or want to pay by credit card. All payment options are accepted including Paypal. Shipping is immediate upon payment. We have 10", 21", 31", 48", 60" and the extremely rare HUGE 72" Gong in stock.